A new report says the country is an expensive place to do business – and it’s getting worse in key areas. THE GOVERNMENT BODY that monitors business costs in Ireland has warned that soaring property prices pose a “significant threat” to the country’s ability to remain competitive. The National Competitiveness Council raised the alarm in its 2017 ‘cost of doing business in Ireland’ report. The paper looks at Ireland’s relative cost competitiveness across a wide range of indicators, from the price of petrol to utility costs. Although Ireland performed well in a number of areas – namely the average cost of starting a business and average income taxes – overall it remains a high-cost location to do business, the council said. It added said that it was “especially concerned” by the dramatic increase in residential rents, noting that prices in some locations have exceeded boom-time levels. “Rising rents and increasing house prices will inevitably impact upon wage demands, increase the cost of living and will damage competitiveness,” the council said, warning that this could have “significant adverse consequences” for the entire economy. On the commercial property front, a shortage of office space in prime locations combined with high occupancy rates in some urban areas has led to a rapid spike in commercial rents. Click here to view a larger version. 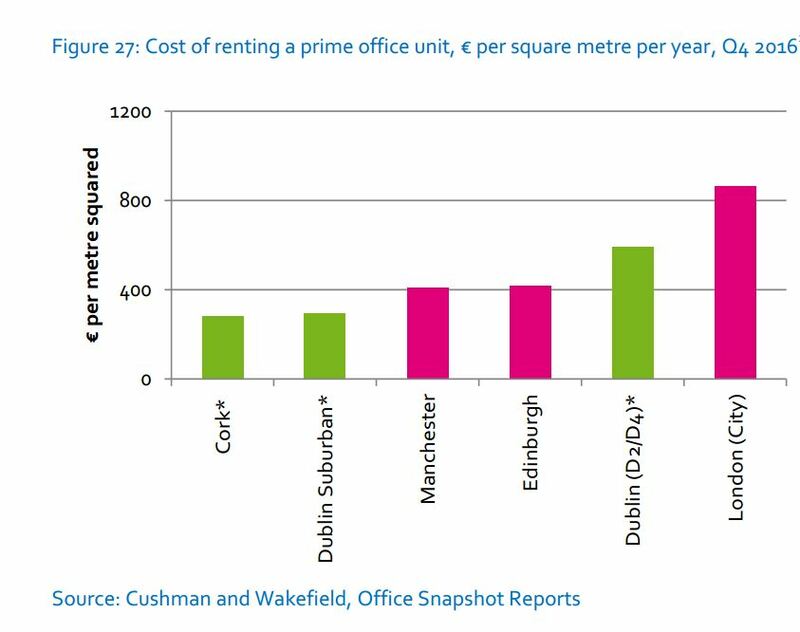 According to the report, Ireland is also one of the most expensive locations in the eurozone for retail rentals. The council said rents on retail spaces on Grafton Street in Dublin increased by 32% last year. Elsewhere in the report, the council said that supply and demand for credit has drastically improved since the crisis – but the cost of credit remains high by international standards. In January of this year, the interest rate in Ireland on loans of up to €1 million was nearly double the eurozone average. Hourly labour costs increased 1.3% in 2016 to €30.40 per hour, compared to €26.70 in the UK and €29.80 across the eurozone. The council said that while “demands for wage increases are understandable after a period of economic stagnation and wage cuts, our relative competitive position will be negatively affected if wage growth outpaces that in competitor countries”. The council also highlighted a number of short- and medium-term risks that threaten Ireland’s competitiveness, including weak infrastructure, skills shortages and increased levels of industrial unrest. Sign up to our newsletter to receive a regular digest of Fora’s top articles delivered to your inbox.